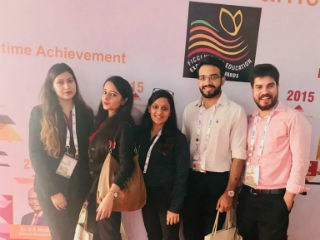 JIMS, Rohini participated in the conference along with exhibitions on Education and Organic India. The thirteenth federation of Indian Chamber of Commerce and industry Higher Education Summit 2017, a global conference and exhibition held from 9th November 2017-11th November 2017 at the Indian Expo Centre, Greater Noida, with the objective of celebrating and honouring various stakeholders for their initiatives which has changed the course of Indian Higher Education with huge participation by various Universities, Colleges, Higher Education Institutions and Educationalist. The exhibition related to Education had plethora of universities from all around the world to seek information about the courses and programmes offered by them. This exhibition provided a great exposure and information on the opportunities available for the students in the pursuit of further higher studies, at global level. 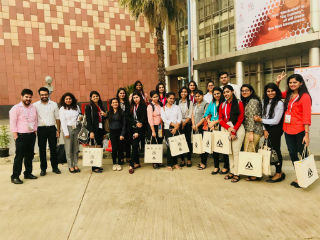 Students interacted with representatives of foreign universities such as University of Georgia, Wellington University of New Zealand, and University of Finland etc. Students also got the opportunity to see the new developing technologies in motion, one of them being a 3D printer in working. On the other hand, exhibition on Organic India made us look into the exposition of farming and organic products. The products ranged from organic vegetables to cosmetics from across the world. It was altogether a rich experience to gain knowledge globally at one premise.